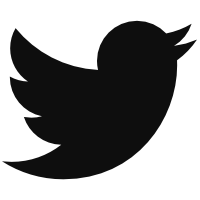 There is an inherent optimism when contracts are signed. The Cleveland Indians believed they were putting themselves over the top three years ago when they signed Nick Swisher and Michael Bourn to four-year deals. The team did not get the production they were hoping for, and after making the Wild Card their first year with the team in 2013, the team has won fewer games the last two seasons, and the Indians agreed to pay money to the Atlanta Braves to get rid of Bourn and Swisher while taking on the contract of Chris Johnson, who they have also jettisoned. As a result, the Indians have a larger percentage of their payroll going to players not playing for them in 2016 than any other Major League Baseball team. 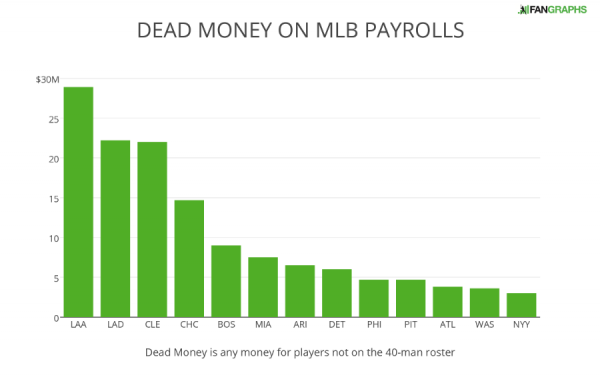 The Indians might have the largest percentage of their payroll devoted to dead money, but they do not have the largest amount in total. The two franchises from Los Angeles both best the Indians. Thirteen of the 30 MLB teams have money going to players not currently on their 40-man roster. The graph below shows those 13 teams, with data collected from Cot’s Contracts. Almost all of the Los Angeles Angels money is going to the Texas Rangers so they can pay Josh Hamilton after the unusual falling out between Hamilton and the Angels organization. The team is also paying a portion of Erick Aybar’s salary with the Braves. The Los Angeles Dodgers have spread their money out among many players. Hector Olivera with the Braves, Michael Morse for the Pirates, Matt Kemp for the Padres are all receiving some money from the Dodgers this season. In addition, the Dodgers are also paying Erisbel Arrabarruena, who is still with the organization, but appears to have been a big international acquisition for little payoff as he has been outrighted off the roster. Of the amount above, about one-quarter of the money is still with the team, like Arrabarruena, and potentially could still pan out, although removing a player from the 40-man roster is generally a pretty good indication about the level of confidence a team has in that player’s future. The biggest expenditure in this manner goes to Allen Craig, who is set to make $9 million this season and another $11 million in 2017 with a $1 million buyout for a $13 million option for the 2018 season. The players still with their organizations are in the chart below. The rest of the players are currently being paid money to players not to play for their teams at all. These groups are divided between trades, where the money was part of a larger deal, and players who were released, leaving the new team on the hook for only the minimum salary. First the players who were simply abandoned despite money still owed. The Cubs took on Brendan Ryan and his $1 million player option in the Starlin Castro trade, but that deal is not really costing the team. One of Theo Epstein’s first major moves in signing Edwin Jackson to a four-year, $52 million hurt the team’s financials a bit more. The Marlins started to pay Saltalamacchia to not play for them at the beginning of last season when the catcher played for Arizona in 2015 before latching on with the Tigers this spring. Chris Johnson was a salary dump, or more accurately, an exchange of bad salaries, when he moved from the Braves to the Indians. Cleveland decided to move forward without him and now Johnson will get a chance in Miami. The majority of the dead money on payrolls occurs in trades. Of the 23 players with dead money, the remaining 14 players had money attached to a trade. There are 12 trades as Jose Tabata and Michael Morse were traded for each other and Nick Swisher and Michael Bourn were involved in the same trade. Here are those 14 players and the money coming from their old teams this season. While the teams providing money was divided among 13 teams, the recipients of the money are consolidated into 9 teams. The chart below shows which teams are receiving the most money to pay for players this season. If we combine the dead money spent and the dead money received, we can determine the net, and the percentage of payroll teams are paying out or receiving to field their teams this year. That the Indians are expected to contend this year on a payroll under $100 million is an achievement unto itself. Contending with under $100 million and nearly one-quarter of that money not even on the roster would be pretty amazing, sort of like what they Rays have managed to do. On the other side, we have seven teams who are receiving a bonus in terms of their payroll as other teams are paying for some of their players. It might be convenient to pile on the Braves and the Marlins, but Edwin Jackson and Nick Swisher are not likely to provide a ton of value for the money they are receiving, and the money was necessary to make them palatable on the roster. The Rangers acquired money for Josh Hamilton and Prince Fielder, but they are still paying Fielder $18 million per year for the next five years and Hamilton’s current value is questionable. The total amount of $136 million is not a major factor for payroll overall, amounting to a bit under 5% of total payroll, but that amount can make a sizable difference for individual teams. The Indians are still paying down their big winter in 2013, and the Angels deal with Hamilton along with a desire to stay under the luxury tax has prevented them from making more improvements around Mike Trout. Meanwhile, the Dodgers have simply been able to erase mistakes and get better players through trades despite some poor signings. We hoped you liked reading The Teams With the Most Dead Money in MLB by Craig Edwards! Great article, but some player contracts while not technically “Dead” money, are pretty much the equivalent. My point is: While the Cubs do have a fair amount of “Dead” money, they don’t really have any “Zombie” money. Maybe Montero isn’t worth 2/28 now, but that’s picking nits. yeah Panda’s money is on life support now at least.